The only thing Donald Cerrone is more known for than being an adrenaline junkie and willing to fight anyone anywhere is his ability to take losing with class. Saturday was no exception. 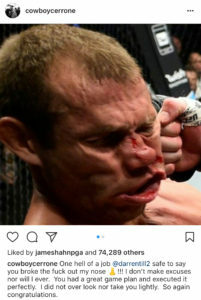 Cerrone posted on Instagram about his first-round TKO loss to Darren Till at UFC Gdansk and was complimentary of the English fighter’s performance. The photo “Cowboy” chose was an action shot of him getting smashed in the face by Till during the fight. Till blasted Cerrone with big left hands in the first round. Toward the end of the round, one of those rocked him and Till followed up with a vicious standing elbow and then a flurry of punches with Cerrone in a turtle position. It was by far the most significant win of Till’s career. Cerrone (32-10, 1 NC) has now lost three straight. He was coming off a close decision defeat against Robbie Lawler at UFC 214 in July. Cerrone, 34, is a notorious slow starter and Saturday seemed like another case of that. Till (16-0-1) has never lost in his MMA career and sports a very nice 5-0-1 record in his UFC tenure, which dates back to 2015. Till is just 24 years old and seems like a top prospect in the welterweight division. To view this article as it appears on MMAFighting.com, click here. To view the full article as it appears on MMAWeekly.com, click here. GDANSK, Poland – Donald Cerrone knows he has a lot more to lose than gain in his UFC Fight Night 118 headliner with Darren Till, but he doesn’t seem to care. An established fan-favorite like Cerrone (32-9 MMA, 19-6 UFC) agreeing to fight an unheralded opponent like Till (15-0-1 MMA, 3-0-1 UFC) is an increasingly rare occurrence in the modern UFC. Top fighters are largely concerned about facing someone who has a ranking next to their name; they aren’t as willing to take the risk of fighting lesser-known opposition compared to when official rankings didn’t exist in the sport. Cerrone, who meets Till in Saturday’s welterweight main event on the UFC Fight Pass-streamed card at Ergo Arena in Gdansk, Poland, isn’t one to fret over such things. His enjoyment of the sport trumps the politics of enhancing or weakening his position in the division, and he said that’s for the best, because fighters who dwell on their place in the rankings don’t appear much better off. To view the full article as it appears on MMAJunkie.com, click here. The UFC returns to Poland for the second time on Saturday with UFC Fight Night 118, which takes place Ergo Arena in Gdansk and streams on UFC Fight Pass. The event is headlined by a key welterweight bout. Donald Cerrone(32-9 MMA, 19-6 UFC) adds yet another octagon trip to his resume when he takes on unbeaten rising prospect Darren Till (15-0-1 MMA, 3-0-1 UFC) in a clash of old guard vs. new guard. Several other notable names fill the 12-fight lineup. For more on the numbers behind the matchups, check below for 55 pre-event facts about UFC Fight Night 118. Cerrone enters the event on the first losing skid of his career. Cerrone fights outside of the United States or Canada for the first time since June 2007. Cerrone makes his 36th UFC/WEC appearance, the most in the combined history of the two organizations. Cerrone’s 36 appearances in UFC/WEC/PRIDE/Strikeforce competition are third most in combined organizational history behind Wanderlei Silva (40) and Dan Henderson (40). Cerrone’s 15 appearances since 2014 in UFC competition are most in the company. Cerrone’s 19 victories in UFC competition are tied with Georges St-Pierre and Demian Maia for second most in company history behind Michael Bisping (20). Cerrone’s 25 victories in UFC/WEC/PRIDE/Strikeforce competition are tied with Henderson for the second most in combined organizational history behind W. Silva (27). Cerrone is 4-2 since he moved up to the UFC welterweight division in February 2015. Cerrone has earned all four of his UFC welterweight victories by stoppage. Cerrone’s 13 stoppage victories in UFC competition are tied for third most in company history behind Vitor Belfort (14) and Anderson Silva (14). Cerrone’s 17 stoppage victories in UFC/WEC competition are the most in combined organizational history. Cerrone’s 17 stoppage victories in UFC/WEC/PRIDE/Strikeforce competition are tied for third most in combined organizational history behind Mirko Filipovic (21) and W. Silva (20). Cerrone’s six knockout victories stemming from a head kick in UFC competition are the most in company history. No one else has more than four. Cerrone’s 14 knockdowns landed in UFC competition are tied with Chuck Liddell for third most in company history behind A. Silva (18) and Jeremy Stephens (16). Cerrone’s 18 fight-night bonuses in UFC/WEC bouts are the most in combined organizational history. Cerrone’s 13 fight-night bonuses in UFC bouts are tied with A. Silva for third most in company history behind Nate Diaz (15) and Joe Lauzon (15). GDANSK, Poland – Donald Cerrone relishes the narrative his UFC Fight Night 118 headliner with Darren Till could be a changing of the guard in the UFC welterweight division. Cerrone (32-9 MMA, 19-6 UFC), who meets Till (15-0-1 MMA, 3-0-1 UFC) in the main event of Saturday’s UFC Fight Pass-streamed card at Ergo Arena in Gdansk, Poland, is aware of all the storylines. From the perception that an up-and-comer will make a name at his expense to the fact “Cowboy” could be falling off by fighting someone outside the rankings after back-to-back losses, Cerrone has heard all the chatter. Anyone who’s followed Cerrone’s career knows there’s almost nothing he won’t take it stride. So, the “old school vs. new school” outlook on the matchmaking certainly isn’t going to come as a bother for arguably the most laid back fighter in the sport. Cerrone said Till deserves all the credit if he successfully uses his name as a building block, but he just doesn’t see it happening. Darren Till asked for a big fight next, and he got one. The undefeated welterweight is set to take on Donald Cerrone in the main event of UFC Gdansk in Poland on Oct. 21, multiple sources told MMA Fighting. MMA Uno first reported the match-up. Till (15-0-1) recently defeated Bojan Velickovic via unanimous decision at UFC Rotterdam, improving to 3-0-1 inside the Octagon. Till will compete in his fifth different country since signing with the UFC. Cerrone (32-9, 1 no-contest), on the other hand, looks to get back on track after consecutive losses to Jorge Masvidal and Robbie Lawler snapped a four-fight winning streak. “Cowboy” is 4-2 since moving up to the welterweight division. To view the full article as it appears on MMAFighting.com, click here.